Today is warm, and I sit outside drinking tea from the fantastic Tea Gallery. It is very nice to finally have some natural light for photographing. I don't have much to say about this tea that Brent hasn't already written. 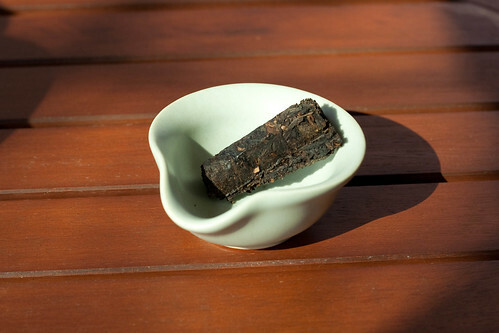 I am using more leaf than him (half a stick in a tiny 60cc gaiwan), so the mineral-y-ness is very intense. This subsides after 4 or 5 intense steepings. If candy bars tasted this good, I would be a very fat man. Luckily, I have this tea instead. For some reason this photo reminds me of the work of Alex. May he soon capture some light of his own and return to the fray. I have conducted a few experiments today that may warrant a separate post at a later date. Tasting the same steeping from both celadon and porcelain have produced slightly unwelcome results. 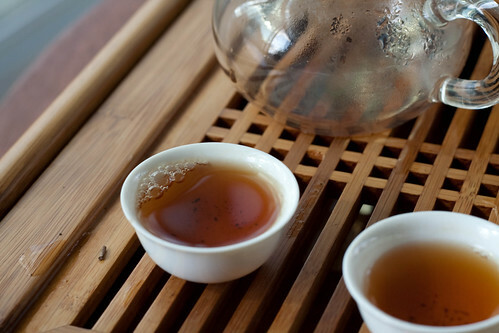 Celadon has rounded out (or perhaps just stolen from) the tea several characteristics like the intense mineral profile mentioned above. This is especially apparent in the new cups in my last post, but also in a celadon faircup. Perhaps the cups need to season a bit? Am using porcelain and glass for the rest of the day.